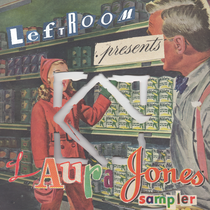 As Laura Jones prepares to deliver her debut compilation for Leftroom’s brand new mix series, ‘Leftroom Presents...’, she drops a three-track vinyl sampler of the exclusive remixes she curated for the compilation. Debuting on Leftroom last year with ‘Intentions’, Jones has gone on to become a genuine artist to watch, with releases for Crosstown Rebels and Visionquest swiftly following. Employing the same deft touch and keen ear as with her studio work, Jones’ DJing has taken her across the globe, solidifying a formidable reputation. Gavin Herlihy’s ‘C’mon People’ is the first track to be chosen for the remix treatment, with Visionquest’s Ryan Crosson being the artist tasked to deliver. With the original track seeing support from everyone from Scuba to Groove Armada, ‘C’mon People’ is one of Leftroom’s biggest tracks and Crosson’s gleaming, futuristic and warped funk serves it well. Herlihy features again with a remix of Matt Tolfrey & Maher Daniel’s ‘It Ain’t Over Yet’, a version where moog synths and all-encompassing bass takes centre stage, leaving the percussive elements to lazily ride a heady musical groove. Finally, Jones’ own ‘Intentions’ track gets the remix treatment from Matt Tolfrey & Sam Russo. Sliding from broken beat into a sturdy 4/4 thump while continuously adding new tones and textures, it’s a mix that oozes the sort of trippy, Tyrant-esque sound that both Tolfrey and Russo are rightly close to. Out 18th June.